At the beginning and end of our recent Tour de Southwest, Matt, Jack, and I spent some time in Las Vegas, the City of Kitsch. Well, maybe it deserves a little bit more credit than that. Regardless of your opinion of Vegas, it’s unique. Nobody can deny that. It also happens to be home to some intriguing cocktailian experiences: some good, some bad, some ugly, and most of them are overpriced. The house always wins when it comes to money in Las Vegas, but your palate has some pretty good odds of coming out on top, provided you know where to look. Photo by Pocheco on Flickr. On our third-to-last day of the trip, we stopped in at Frankie’s Tiki Room, located among, but not in, the strip malls outside the center of the city. Now, the weather was 100º+ and the sun was blinding, and upon entering into Frankie’s you have to wait several minutes for your eyes to adjust before moseying up to the bar or to a table. It’s that dark inside. Pufferfish lanterns don’t give off that much light, apparently. 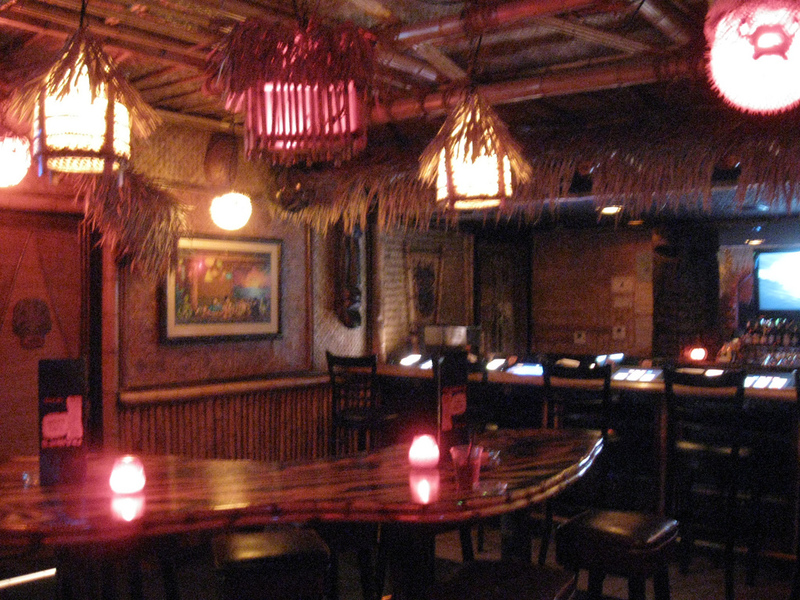 Regardless of illumination, or lack thereof, the décor is fantastic, and as authentically Tiki as you can get. Carved statues, cheesy velvet paintings, TVs looping 1930s tropical-esque film clips, tables and chairs hewn from logs and carved into even more Tikis, it’s all there. Oh, and don’t forget the wall of excellent rum behind the bar, not to mention the custom-made ceramic drink mugs. The visual atmosphere is perfect, the actual atmosphere (meaning the air) is smoky, so expect to smell like cigarettes for the rest of the day. A blend of surf music and Martin Denny exotica makes up the soundtrack (wonderful!) and no, they do not play the Beach Boys (even more wonderful!). Looked like Cruzan Light and Appleton Extra (2 parts each), Monin Orgeat/Almond syrup, Bols orange curaçao, and Fresh Lime Juice (1 part each). Fresh mint sprig for the garnish. Greatly resembled (in taste and assembly) what I call Robert Hess’s “Makeshift Mai Tai.” Good, but too sweet, and the rums lack distinction. For anyone who’s had the Bum’s recipe, this is an acceptable substitute in the spirit of the original, but a little lacking. Cruzan light and Myers’s Original Dark, and possibly a third. Not sure what else went in, though they credit it to Don the Beachcomber, which is good. A nice blend of rums, and the best drink of our three. A Frankie’s original, but minus a ceramic mug (the Bearded Clam’s name and mug may offend some, but come on, this is island kitsch we’re talking about here; lewd and rude is acceptable!). Cruzan light, mint, a nearly-undetectable hint of passion fruit syrup, and what tasted like ginger ale. Watery, and could be better. Matt and I finished up with some El Dorado 15-year, sipped neat, which is always enjoyable. No Lemon Hart to be found here (though after talking with the bartender it seems like they had it in stock before). The list of original drinks is impressive, though it seems to emphasize fruity liqueurs and flavored rums, which scare me away. I was sorely tempted to try their version of the 1934 Zombie (a lethal and delicious home project, if you’re up to it) or the Lapu Lapu (which I’ve not mixed here at home), but erred on the side of sobriety. If they make the Zombie to match the original, no doubt my rating for their drinks would go up, and matching Leon’s Full Service might be tough! I know Tiki places are not, and should not, be regarded as classy, high-end bars, but cheesiness and quality drinks can co-exist. I know they can! Extra points go to the use of Monin, Bols, and Cruzan, and for the fresh citrus juices. All the essentials are there, just need to see some serious Tiki-mixing action take place. Maybe another visit is needed. 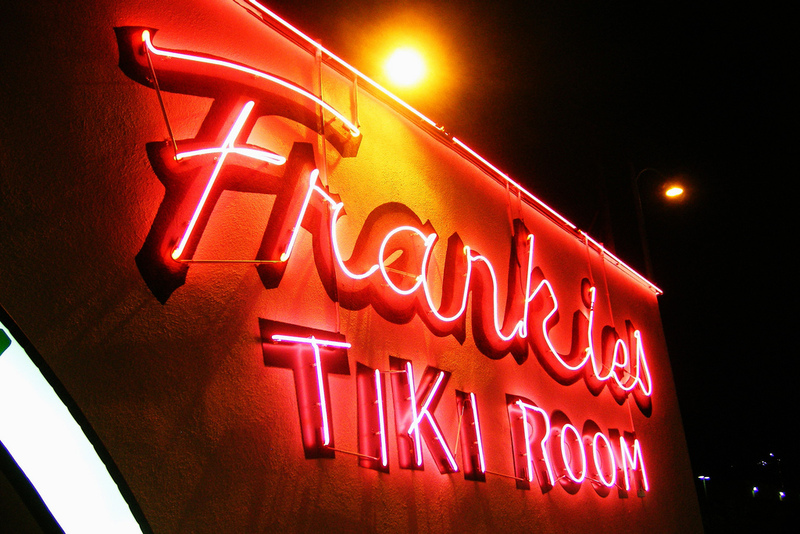 The décor, again, is great, and the custom Tiki mugs make Frankie’s a noteworthy stop for the Tiki pilgrim. I picked up a Malekula mug on the way out as a souvenir. We got some swizzle sticks and matchbooks out of the visit, too! Overall, a good stop to make, and recommended for all Tiki-philes. Don’t expect to be wowed by the drinks unless you’re both a connoisseur and friends with the bartender, but go for the authentic atmosphere. Check out their Artists Page for info on the mugs and decorations, and head over to Humuhumu’s Critiki page to see what other visitors have said (most are astoundingly enthusiastic…maybe I’m too picky). 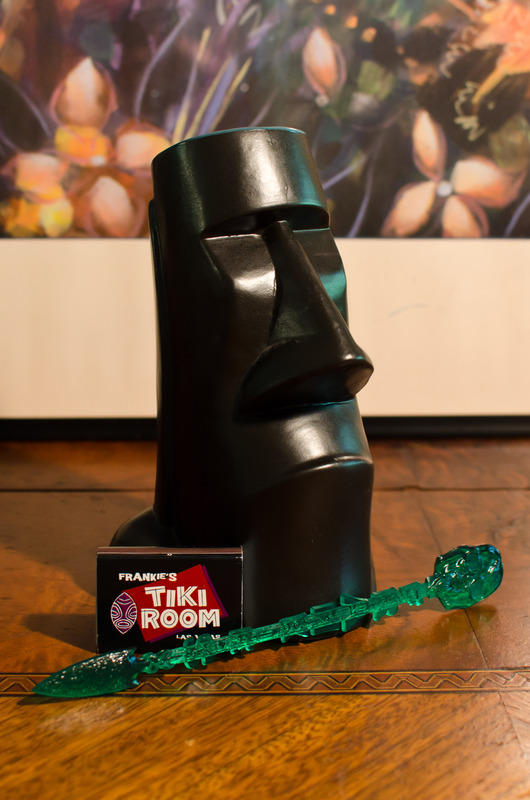 If you’re a Tiki mug collector, check out their online store. 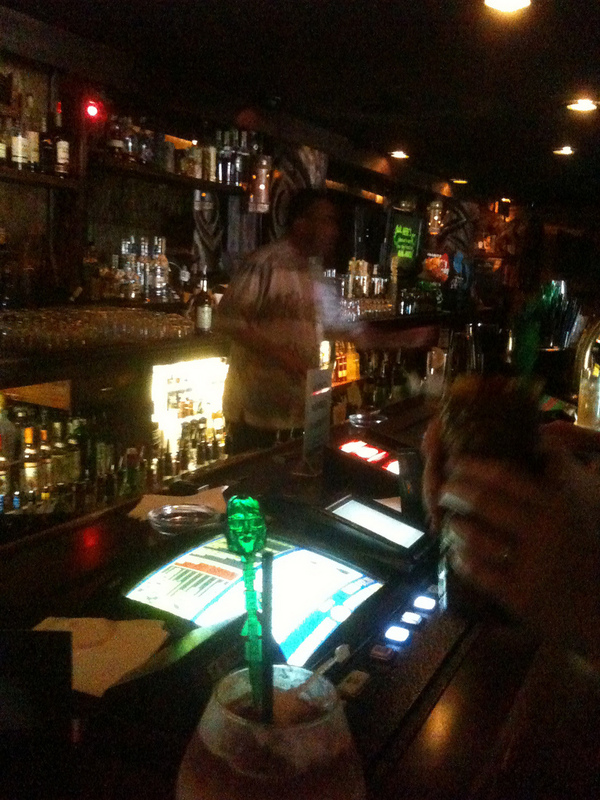 This entry was posted on August 28, 2011 by IJ Lauer in Bar Visit, Las Vegas Bars, Rum, Tiki and tagged bearded clam, frankie's tiki room, las vegas, mai tai, malekula mug, navy grog, tiki bar, tiki mug.